I thought you would enjoy the irony of the celestial golden arches high above the famous man-made version. 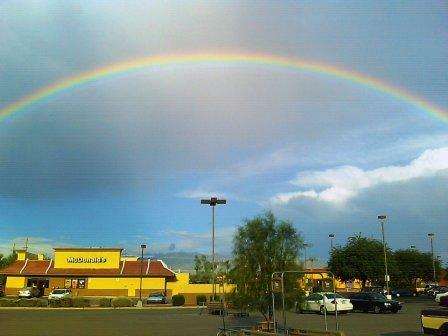 Even though it looks like a shameless ad for McDonald's, I think it is definitely worth sharing the image when we get the pleasure of seeing a full rainbow, unbroken by clouds or buildings. Just another beautiful aspect of our monsoon storms. Great shot. What a luck to make this wonderful and colourful photo.